Growth, it's one of those elusive things that just kind of sneaks up on you. Unless you're a teenage boy, growth doesn't happen overnight. In fact, you can grow so slowly, whether it's your maturity or your character or your HAIR, that you don't even realize that anything changing! Well, that is, until one day you say: "HUH. Something is different..."
This is exactly what has been going on with my hair. 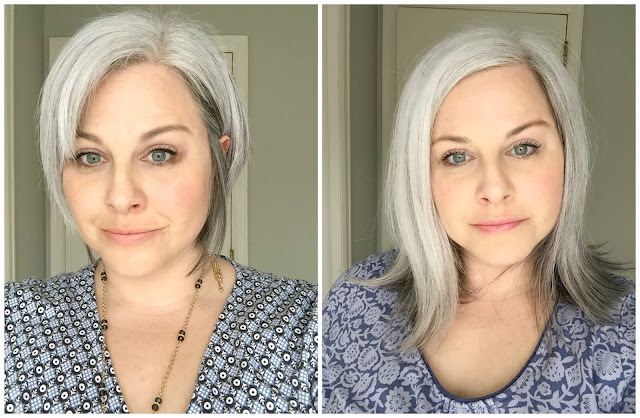 Silver sisters, I think a lot of you might know the struggle- you're slogging through your gray hair grow-out and it just feels like it is taking FOREVER! Right? You've been there too? Even after our hair is all one-ish color and we've got some length, at least to me, it still didn't feel like my hair was growing as quickly as I wanted it to. So last spring, when I turned up with a bunch of short, short hairstyles, Lydia helped me to realize what I would like the most is a bit longer, angled bob. That cut is the photo above in the upper left hand side. Fast forward to this spring, about a year later, and it hit me that my hair was actually starting to get longer. In fact, when I compared two photos, one from the day of my cut and one from this spring, I was amazed to see how much my hair had grown! It just kind of snuck up on me. The reason that I'm telling you all of this is because I thought maybe, just maybe the multivitamin that I began taking last year, helped to speed up my hair growth. 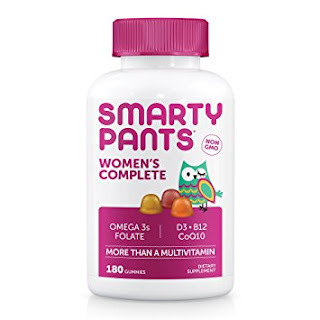 I'm putting it out there that I am not a scientist or a doctor or a nutritionist, so I don't know for sure, but I do think that after taking the SmartyPants Women's Complete with fish oil and Biotin, that my hair began to get longer and stronger and my nails did as well. I know there is a lot of controversy out there as to whether or not you actually need a multi, or if they are good for you. I know there is controversy over ingredients, dosages and even the fact that these are "gummies." You need to do what is right for you, and if you're up for trying them like I did, much luck to you! I happen to think they taste yummy and never miss a day. At any rate, what I take is SmartyPantsWomen's Complete. You can find them on Amazon and at Target, really all over. As a Silver Sister, I find that when we share from our experiences, it helps to make this journey a little easier. I noticed my hair started growing a lot faster within a couple months of taking biotin and evening primrose oil. First, it's good to know that yellowing and brassiness happens to most of us. It can be from pollutants in the environment, UV rays and most of all build up from hair styling products that we use, especially when heat is applied from things like hairdryers and curlers. I recommend that you start with a clarifying shampoo. Many many out there. They will help to get the build up off of your hair. Then, a good "purple" shampoo and conditioner. After that, it's just about being careful what you put on your hair (if you put anything on) like styling products. Nothing that is heavy or yellows. Many people steer clean of silicone in products for example. Do you see the tab at the top of the page that says" " My Favorite Products!" I go into detail listing my favorite hair care products, maybe one will sing to you! Also, my current favorite purple shampoo and conditioner not on there is called "Joico Color Endure Violet." I think it works so well. You can find it on Amazon. Thank you Lauren your hair looks Great! You are really an inspiration to me to me! I already feel like you are my best friend! I quit dying my hair last april 10th, I´m 56 years old, I live in Colombia, South America, and I have dyed my hair since I was 21! You have been a true inspiration for me. To stop dying my hair has been one of the most difficult decisions I have ever made, but there is no turning back. It has been a little over two months since I dyed my hair last and every morning I see myself in the mirror and I just cringe... But then, I remember your posts and your encouragement and I feel like you are my best friend giving me support and encouraging me to go on. My family and friends are mum about it but I know they do not agree with my decision. Yesterday I ran into one of my students (I am a semi-retired teacher) and she did not recognize me at first, she said "what happened to you?" I almost died! I told her I was in the process of letting my gray hair grow out, and she gave me a puzzled look and told me that she thought that I was sick. So, (sigh!) here I am today, visiting your blog once more time to get encouragement to go on. 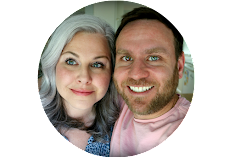 Thank you so much for the time and effort you have invested in your blog. I just wanted you to know how grateful I am to you. It has made a tremendous positive impact in my life! It is so nice to read about your journey and to realize that there are some many other women struggling with the same issue. At this time in my life I´m looking within and being more honest and true to myself. Gracias, gracias, gracias Lauren! Best wishes and blessing from Colombia.